Max Uetz (‘18) at bat in the Minnesota Vikings stadium. Luther baseball won their season opening double-header 7-5 and 6-5 against Carleton College at the new U.S. Bank Stadium in Minneapolis, MN, on March 1. 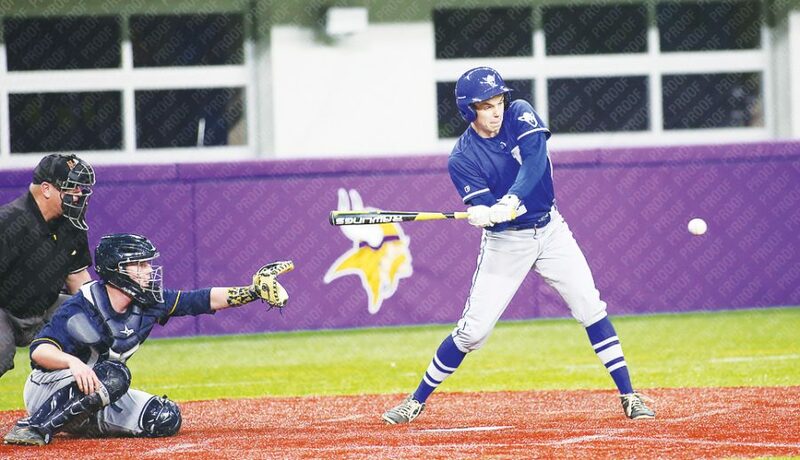 In an interview with Chips prior to the games, the Norse were very excited to get back on the field, according to outfielder Gannon Jordahl (‘18). The opportunity to play in the U.S. Bank Stadium arose from the demolition of the Metrodome in 2014. The Metrodome was the stadium the Minnesota Twins, Minnesota Vikings, and area schools used for various sporting events. The Norse would otherwise play there for winter games. Head Baseball Coach Bryan Nikkel said that the team was very excited leading up to using this new venue. Before the game, Luther baseball hosted an alumni social in Minneapolis. There were approximately 80 family members and friends of Luther baseball in attendance. In the winter portion of the baseball season the team plays non-conference games. First-baseman Bryce Hingst (‘19) explained the significance of this part of the season. Collegiate baseball teams across the country will normally have non-conference schedules in the first part of their season, infielder Joe Silversmith (‘17) said. Hingst went on to explain why these games are important. Looking ahead to the in-conference games, the team is hoping to continue the energy of their 2016 season. Silversmith noted that this part of the season brings challenges in terms of competition. “We have a pretty tough beginning schedule, so we want to come out with as many wins as possible,” Silversmith said. Hingst also reflected on last year’s conference win. Additionally, the Norse hope to nurture their team mentality. Pitcher Collin Nimrod (‘19) explained the importance of a good team atmosphere. The Luther baseball team lost 14-7 to Washington University on March 4 and played them again in a double-header on March 5, winning the first 9-2 and losing the second 7-5. Come spring season, Silversmith is hoping for a lot of student support. “We have a brand new stadium built down there so we want to see people fill it up,” Silversmith said. The first home game will be played March 31 against Coe College.